Welcome to Elisabeth and Didier Lhermite ! Congratulations for joining the Wheaten breeding community with your " Irtreawheat " kennel. Beautiful Wheaten figurines made in clay by artist A. Schouten. We are delighted to announce a new kennel in France "Wheaten Heaven" owned by Joelle Vialle. New kennel in The Netherlands under the name of "Alanagh Eireann" ! We are happy to welcome Ellen Touber and her Wheatens. "Alanagh Eireann" website will be soon online. 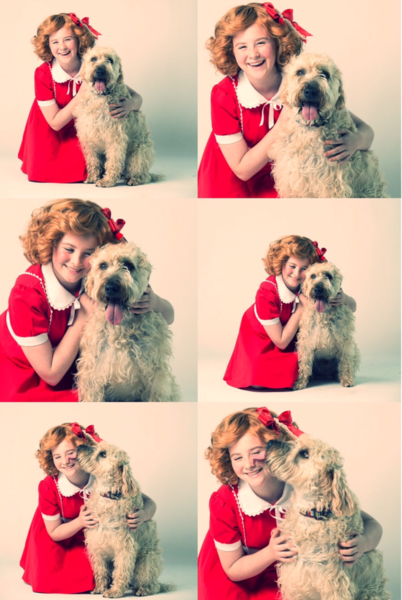 Parkalissene Wheatens are delighted to announce their Wheaten Star "Crew" staring in the Comedy "Annie". Crew will be perfoming from July 20th to August 20th at the Cork Opera House. Buy your tickets !